For my last post in this series with DVF (see my past looks in their wrap or lace dresses), I chose a third silhouette with this A-line sheath. When browsing stores that don’t specifically offer petite sizing, I’ve learned to look for certain signs of potential. My eyes zoom towards empire-looking waistlines or mini lengths on leggy models, which likely equate to a normal-waisted dress with regular length on me (as was the case here). This post was sponsored by DVF. I love the pearls. The belt knot tutorial was very helpful! Nice trick with the belt. It looks so good too. You look beautiful classy girl! Hello from a new reader and commenter! As a fellow petite gal, I am loving and appreciating all your resources and tips! Can I also say that I so appreciate your mix of high/low/designer/vintage/DIY? There are so many fashion blogs that trot out a new designer item (or three) daily and seem to be a) completely inauthentic, and b) getting dressed up for the sake of fashion, not to help or inspire anyone in their actual getting dressed endeavors. Really appreciate that this site is useful and beautiful, both. I love that belt knot! Great tips as to how to find a dress in a regular fit store! This may be a random questions, but do you think you can do a post just dedicated to cardigans? That may be overboard but I feel like I need to add more to my wardrobe now that I have a different change in occupations and I need to purchase some more. I just do not know where to start. I've been following your blog for a while, you always look so polished and beautiful! I was wondering if you could do a tutorial on hair styling? That pretzel knot is a great tip. And i am going to DVF styling event this week, will look for some of these dresses! Where did you get your coat? I love it! Thank you for the belt tutorial! The dress looks beautiful with the white coat. I love how you styled the dress with the belt and pearls! The finishing touch with the coat and metallic heels make this outfit sheer perfection! Such a cute look! 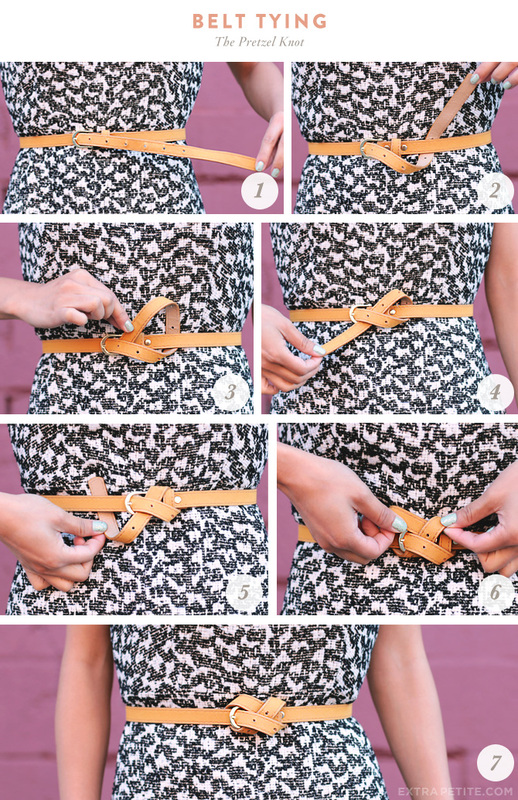 Loving that belt and your belt how-to! Definitely have to remember this next time! I like how you styled your hair here — is it the same as your youtube hair tutorial with the bump-it? If not, I'd love a tutorial. I like the print and style of the dress. Thanks for the belt tutorial. Love the belt tying ideas! Can you share how you do that hair up do from this post? Thanks a ton!